We’re delighted to announce the publication of our 2012 Emerging Investigators issue, which contains a massive 6 HOT articles! Read the editorial from Amy Herr and Aaron Wheeler to find out why this group of researchers is affectionately known as control freaks..
To coincide with the Organs on Chips: Human Disease Models meeting being held at the Lorentz Center, The Netherlands, 24th – 28th September, Lab on a Chip and Integrative Biology are delighted to bring you a free* collection of articles on organ-on-chip research. These articles will only be available until October 8th so hurry, don’t miss out! *Free access is provided to subscribing institutions or to individuals through an RSC Publishing Personal Account. Registration is quick and easy at http://pubs.rsc.org/en/account/register. Another Lab on a Chip article has been picked up by the press, describing a nifty micropump which is powered by fermentation of yeast. Manuel Ochoa and Babak Ziaie, Purdue University, created the “microorganism-powered thermopneumatic pump” by stacking PDMS layers with a silicon substrate drug reservoir and a chamber for the yeast. They showed that when the yeast ferments under body temperatures, the micropump could displace the drug in the reservoir. 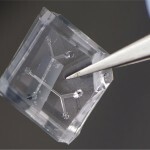 The technology has caused excitement due to its potential for use in transdermal drug delivery patches, by driving tiny microneedle arrays. Lab on a Chip Editor Harp Minhas will be attending Optofluidics 2012 which starts this Thursday at Dushu Lake Hotel, Suzhou, China. If you are planning on attending the meeting do introduce yourself to Harp as he would be delighted to meet you. Also, if you’re off to the conference don’t forget to take a look at our themed issue on optofluidics before you go! Jumping straight from this amazing achievement to the future, several blogs have already discussed the potential of this technology for advanced biorobotics (this article was our favourite). Professor Asada is a little more modest and discusses the potential of the engineered muscle to control endoscopes or be used in drug screening programmes. Kevin Raymond et al. have developed an ‘optofluidic nose’ for sensing organic liquids based on wetting in photonic-crystal arrays. Haiwang Li and colleagues demonstrate the design of a bi-concave lens to perform both light focusing and diverging in-plane. Yasutaka Hanada and coworkers show how to create a highly sensitive optofluidic chip for biochemical liquid assays by coating microfluidic channels with a low refractive index polymer and use of an optical waveguide. Jigang Wu, Guoan Zheng and Lap Man Lee focus on compact systems in their review of optical imaging techniques that can be integrated with microfluidics. Chao-Min Cheng and colleagues provide thoughtful insight into the application of optofluidics to synthetic biology in this forward-looking Frontier article. Shih-Kang Fan’s team manipulate 200 nL bubbles with DEP and ignite microplasma within them, with potential for future applications in the biomedical field. Wenqi Hu, Kelly S. Ishii, Qihui Fan and Aaron T. Ohta report a hydrogel microrobot which can be manipulated by laser-induced bubbles. Single or pairs of robots are able to assemble polystyrene beads and yeast cells into patterns. Remember, all our cover articles are free to access for 6 weeks, and our HOT articles for 4 weeks. All you need to access them is an RSC Publishing Personal Account – signing up is quick and easy. Lab on a Chip is delighted to publish what we believe is the first issue dedicated to research in the exciting new field of optofluidics, guest edited by Professors Ai-Qun Liu (Nanyang Technological University) and Changhuei Yang (Caltech). Read their editorial introduction to the issue, where they discuss some of the most innovative new developments in this rapidly blossoming field. Katsuo Kurabayashi et al. have discussed the promise of optofluidic technologies to enable on-chip cellular phenotyping in their critical review which features on the outside front cover. On the inside front cover Joanna Aizenberg and colleagues have developed an ‘optofluidic nose’ – a litmus test which can differentiate organics liquids based on wetting, while on the back cover Teck Neng Wong et al. have created an optofluidic bi-concave lens to both focus and diverge a light source by applying an external electric field to a constant flow. On the other back cover Katsumi Midorikawa and coworkers fabricated highly sensitive optofluidic chips for biochemical liquid assays. Don’t forget – all articles on our covers are free to access for 6 weeks! You just need to sign in with your RSC Publishing Personal Account. We’ve got another jam-packed issue for you this week, with some colourful articles on the cover from Lee Hubble, Jochen Hoffman and Helena Zec. And on the back cover Helena Zec and colleagues present a droplet platform for generating nanolitre droplets of combinational mixtures. Sample plugs from a multiwell are split into nanolitre droplets which can be injected with four different reagents – in this paper, food colouring, to prove their concept. Due to the automatic spatial indexing of the droplets, droplet barcoding is not necessary. Also in this issue we have the latest Research Highlights from Ali Khademhosseini to keep you up to date with the most important miniaturisation research, Acoustofluidics number 17 from Michael Gedge and Martyn Hill and an interesting Focus article from Samuel Stavis on testing standards for lab on a chip devices, as well as plenty of HOT articles. Ps. Don’t forget all our cover articles are free to access for 6 weeks following a simple registration! 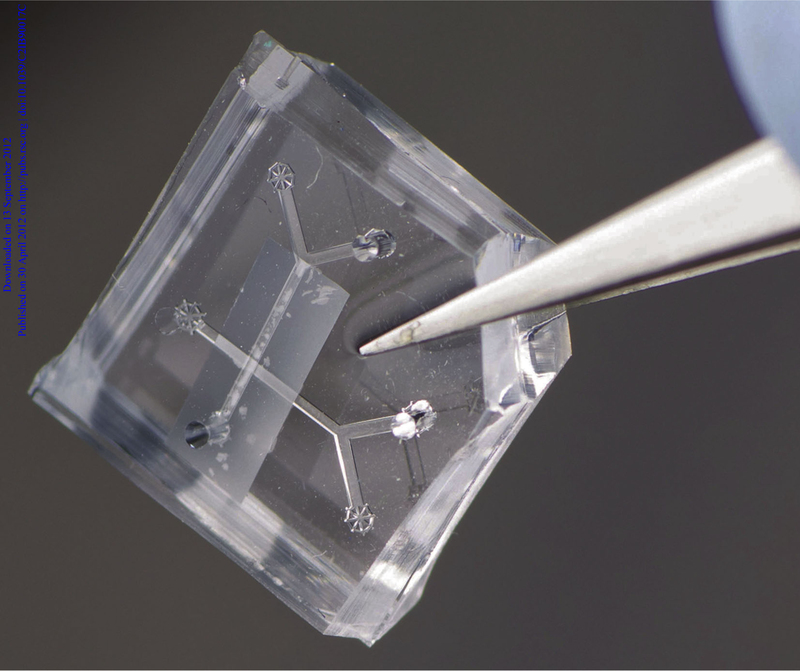 Yanyi Huang and colleagues at Peking University have developed a microfluidic-based assay to allow them to quantitatively measure single cell migration speeds. Existing methods for determining cell migration are abundant, as the process is important for processes such as cancer metastasis, embryonic development and wound healing, but it is very difficult to distinguish between migrating and proliferating cells in current assays. As with all our HOT articles, this one is free to access for 4 weeks following a simple registration.